I’ve had discussions with multiple caregivers and parents recently about IEP objectives and evaluation/assessment. I think this is not only an important issue but is an issue that is a foundation for special education. The purpose of special education, as established in IDEA, is outcome based. The focus is on the future life of the student. Decision making and services are made in this context. With this in mind I believe evaluation/assessment and the development of the IEP, especially objectives, fall under this context. There should be an alignment to the long range future of the student. Often the focus of special education is on deficits. Evaluations identify deficits and the programming is developed to address the deficits. Certainly many or most educators are conscientious of long range outcomes but the deficits are the priority. Contrasting this is a standards based approach. I do not mean every student working towards grade level work as this would be entirely inappropriate for severely impacted students (like my son). I mean more of an outcome based focus with long range goals as the priority. If the purpose of special education is to prepare students for life after K-12 education then the standards or outcome based approach is necessary. A deficits based approach can result in progress but progress that does not translate into necessary preparation for the future. Here’s an analogy. A person gets up in the morning and has to go to work. She has a range of tasks from the essential, e.g. getting dressed, to the desired but not essential, e.g. send an email to a friend or make a cup of coffee to go. As is often the case with me, she runs out of time. Maybe she can try to send the email but then has no time for the coffee. Maybe she needed to print a report for work but overlooked it because she was preoccupied with all the other tasks. At some point she has no choice and has to leave regardless if the coffee is ready or the report is printed. Our kids have a limited amount of time in special education. Like the person going to work, at some point our kids are exited from IDEA regardless if they are prepared. We know a great many of our kids are not prepared. A deficits approach prioritizes urgency at the expense of important. The email is sent but the report was overlooked. A standards/outcome based approach focuses on importance not urgency. This doesn’t mean deficits are overlooked but they are prioritized. In my experience in school and in working with many different parents I have found a focus on deficits. A sophomore in high school spent an entire year on arithmetic (doing this by hand) and basic pre-algebra skills because these were deficits. The goal is for him to go to a community college where he would qualify under ADA for use of a calculator. A junior moderately impacted by autism was taking a basis algebra class. His postsecondary plans focused on some level of independence and maybe a supported work placement. He couldn’t count money but he was being taught how to simplify 3x + 2x. Often, accommodations, e.g. teacher prompts, are included in assessment of IEP objectives “because the student needs this to be successful.” I’ve heard this in multiple situations. Contrast this with another situation. I helped a family with a middle school student with autism. His mother explained to me that they had a goal of him having some type of job and some level of independence. He was very much interested in cars and working with cars in some capacity for his job. The math needed for auto repair is mostly measurement. We mapped out a muti-year plan for his math to focus on measurement and consumer math. He was not going to learn to simplify 3x + 2x but would focus on what a 5/16 inch wrench is and what is meant by 5/16 of an inch. The first student I ever helped when I began my work in special education was a sophomore with aspergers. He received ineffective special education support and entered community college with the same challenges and gaps in math as he had his sophomore year. I served as a kind of case manager for him as he worked through community college. He needed help with study skills, math content, stress, completing work etc. This semester he is likely to graduate from community college and plans on transferring to a university. Again, I am not proposing that deficits be marginalized. The deficits can be prioritized based on long range goals and addressed accordingly. The photo of the table above shows 3 categories of post-secondary outcomes and the level of focus on standards and curriculum. Some vocational training or college course work or a community college certificate or degree. My position is that the current student work and support should be aligned with the appropriate outcome. In my 21 years in working as a math teacher (with 6 that focused on special education) I have rarely seen IEP objectives for math that are directly aligned with the math curriculum that is to be accessed by the respective student for whom the objectives are written (see photo below). 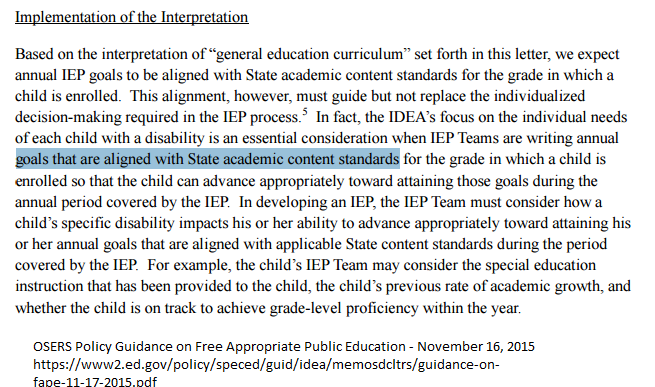 The photo above shows an excerpt from an OSERS letter regarding IEP goals that are standards based. Below is a list of IEP objectives I have written for use in an IEP. They are directly aligned with the math content to be covered. Some educators insist on including the specialized instruction as part of the setting of the objective. I have no qualms with this as long as the student ultimately will demonstrate mastery of the objective without the supports (unless the supports are to be permanent or lead to subsequent objectives that will not have the supports included). NOTE: If you would like suggestions for IEP objectives please use form below and I will add them to this post. Goal 1: Xxxx will accurately simplify expressions and solve 1 variable linear equations. Objective 1: Xxxx will simplify a given algebraic expression 8 out of 10 times with only minor algebraic mistakes (e.g. arithmetic error). Objective 2: Xxxx will solve a given 1 variable linear equation by simplifying first 8 out of 10 times with only minor algebraic mistakes (e.g. arithmetic error). Objective 3: Xxxx will solve a given 1 variable linear equation with a variable on both sides 8 out of 10 times with only minor algebraic mistakes (e.g. arithmetic error). Goal 2: Xxxx will accurately complete linear function problems by identifying and using slope and intercepts. Objective 1: Xxxx will identify and interpret slope given various representations (equation, graph or table) 8 out of 10 times with only minor algebraic mistakes (e.g. arithmetic error). Objective 2: Xxxx will identify and interpret y-intercept given various representations (equation, graph or table) 8 out of 10 times with only minor algebraic mistakes (e.g. arithmetic error). Objective 3: Xxxx will convert between various forms of a linear function 8 out of 10 times with only minor algebraic mistakes (e.g. arithmetic error). At the turn of the century education has seen a standards based reform movement, e.g NCLB. IDEA 2004 reflects this with a change in the focus of an IEP towards curriculum standards. What does this mean? The focus of academic based IEP goals and objectives should be strictly aligned with the curriculum standards. This helps to make the general curriculum accessible for all students – to the extent possible. For example, in the past a math IEP objective may be written based on weaknesses found in psychological tests regardless if this was in the curriculum covered in the life of the new IEP. Maybe a student had trouble with calculations with fractions on the testing so an objective would focus on improving these types of calculations even if the class was not going to cover calculations with fractions. These new types of IEPs are called Standards Based IEPs. Here are a couple of links.